By Mare, March 3 in DarkMatters: Introductions. I know that these topics do nothing but fill the forum, without any meaning. This "quiz" in fact, is not at all different from the previous ones, but it is only their union and refinement. So if you do not have time or if you are on DarkMatters for more serious reasons, do not read on. I chose to ask a few questions, to get bored as little as possible. The purpose of this topic is obviously the one written in the title. Make sure that each member of the community knows others better. In short, it is useless but it's nice. 2) Name your 3 favorite hobbies. 3) Do you like being in the spotlight? 4) Are you lonely or do you prefer community life? 5) When is the last time you fell in love? 8) Favorite food (you MUST say: "pizza")? 9) What do other people think of you? 11) Something that make you feel angry? 12) How bored were you from 1 to 10 doing this test? Oh no! I finished the emojis! If I have to chose one.... I think red. I. Linstening to old school rap music; II. Writing comics; III. Creating table games. Sacred Underworld ; Dirty Bomb; Stick it to the man. I usually don't watch movies! Haha nice one I’ll give it a go! Blue. Green is a close second. Gaming. Bouncing to music. Watching movies. ﻿ 3) Do you like being in the spotlight? Pizza. Pasta. Kebab. Not necessarily in that order. Calm and down to earth. My secret love is the Resident Evil franchise. 11) Something tha﻿t make you﻿ feel angry? This is an awesome new idea! lol I first remember when these questions went up years ago... online forums were not so common, and being able to reach out to others and "connect" was so delightful. It still is these days, but FaceBook seems to take center stage. And... re your fave food... Course Pizza! being outside, hanging out with my family, this forum and Sacred! 3) Do you like being in the spotlight? Absolutely!! 4) Are you lonely or do you prefer community life? Community first...but I'll go for alone every once in a while...but not too much, I have to much to say to others! 5) When is the last time you fell in love? two days ago when super bacon pizza! shoulda picced it, will next time! 8) Favorite food (you MUST say: "pizza")? Toss up tween three... Pizza, (any kind) Thai Food ( just love the fragrances and aromatics!) 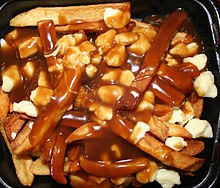 and... Poutine! 11) Something that make you feel angry? When the internet is down...I go ballistic! Playing Sacred 2. Writing. Painting. When it's appropriate and often when it is not. There is a proper time for both. When I met my soul mate. Right. It is never wrong. PIZZA is not it. I love a perfectly grilled steak. They say that I am a man of my word. 11) Something that makes you feel angry? People who have the same irritating traits that I dislike about myself annoy me to no end. However, they who put pineapple on a pizza go well beyond even that. Isn't zero an option? It should have been. I like being by myself, but occasionally I like company. 4 years ago. Still in Love with him and we are gonna get married. I P will I not Z sell Z my A soul. I love curries (Thai, Indian, Malaysian, Chinese... etc), My own Ice creams that I make... Good pastas, home made bread with butter, butter sauteed vegetables, couscous or quinoa salads with lots of olive oil... urgh, just give me good honest delicious food. They think that I am a red wine addicted psychopath, that has a great sense of humour... people at work. I love Civilazation 5 too! It's the best turn-based strategy game in the world and I played it the last time yesterday evening! Also, I've played GTA SA some years ago. Gaming, Watching TV, and Sleeping. I haven't fallen in love, I don't give my heart into something easily. I love pizza but I love beef jerky, hard choice. I really enjoyed The Hobbit. Sacred 2 not being on Xbox, that makes me angry. Not really bored, I had nothing better to do. Go To Topic Listing DarkMatters: Introductions.